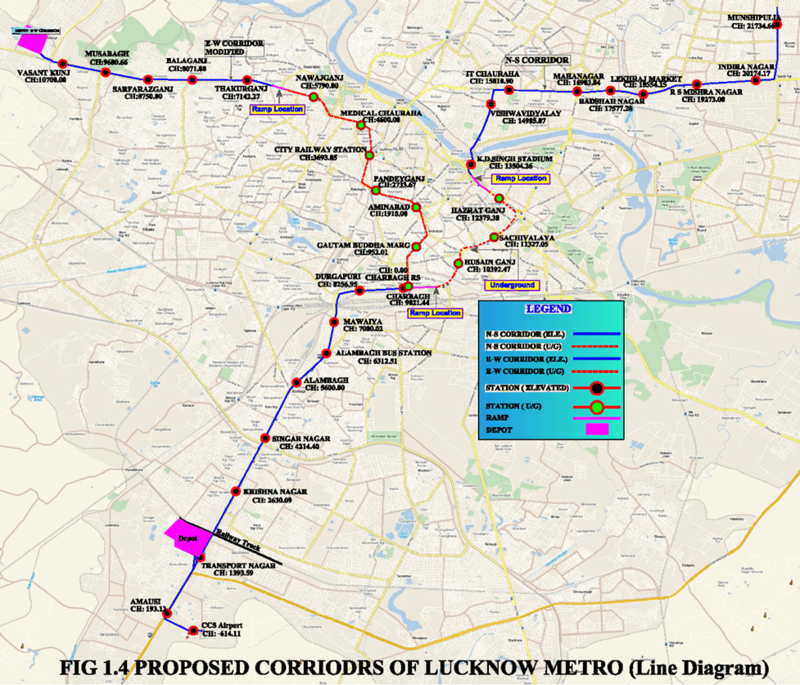 Two Metro corridors for Lucknow namely N-S corridor and E-W corridor have been identified with total length of 34km. Initially, implementation of 22.878Km partly elevated and partly underground N-S corridor is underway. Out of this LMRC has already commissioned the 8.5 km "Priority Corridor" from Transport Nagar to Charbagh for public services with effect from 2017. Silent DG sets, Fire detection and suppression system etc. set-up as a 50:50 jointly owned Company of Government of India and the State Government for planning, implementation and operation of Lucknow Metro project. Phase-1A of Lucknow Metro Project is being implemented initially for 22.878Km long North-South Corridor from CCS Airport to Munshi Pulia after obtaining "In principle" approval from GoI in Dec, 2013. Project has been cleared by Public Investment Board (PIB), Ministry of Finance, GOI. Dr E. Sreedharan acting as Principal Advisor to LMRC for speedy implementation of the Project. Priority Section of 8.5 km from Transport Nagar to Charbagh selected for implementation and commissioning by April, 2017. After award of contracts for Detailed Design Consultancy (DDC) & Civil Construction for viaduct and stations in August 2014, physical construction commenced in September, 2014. All the System Contracts like Rolling Stock, Signalling, Traction, Telecom, Depot, Track, AFC etc. awarded for the entire corridor and works in progress. General Consultants: Consortium of Ayesha-KRNA-Geodata-Aarvee appointed for technical guidance and project management support. Works nearly completed in the Priority Section except minor finishing works. Train Trial run commenced on 01.12.2016 as per target. Tender awarded and work in progress at fast pace in the Underground portion including ramp and three stations at Hussain Ganj, Sachivalaya & Hazrat Ganj. Civil Construction for balance elevated section from KD Singh Babu Stadium to Munshipulia also in progress . Target date for completion of entire Phase-1A project - March, 2019. Civil and E&M works for Under Ground section from Charbagh to K.D. Singh Babu Stadium in progress through M/s Gulermak-TPL JV. Diaphragm wall construction for all the three stations in progress viz. Hussain Ganj, Sachivala and Hazaratganj. First TBM commenced work on 23.01.2017 about one month ahead of schedule. Second TBM also commenced work on 28.02.2017. Tunnel Segment casting in progress at casting yard. 309m & 81m tunnelling completed in UP Line and DOWN Line respectively till first week of April, 2017. Civil works for elevated section (LKCC-07) beyond K.D. Singh Babu Stadium to Munshipulia in progress through M/s L&T. Tender for construction of Underground Station at Airport has been invited after obtaining 'No Objection' from EIB and received on 22th March 2017. Tender evaluation under process. Recruitment of Staff: Staffs have been recruited for O&M including SC/TO, CRA and JEs on open selection basis. Practical training on O&M has been imparted by deputing the staff to DMRC for different modules. Training on specific technical subjects of Metro Technology. Manning of Entry/Exit gates, Platforms and vulnerable areas at Stations Security of assets at Stations, Depot, RSS etc. LMRC also working as Interim Consultant for implementation of Metro projects in Kanpur and Varanasi. Final DPR submitted on 07.11.2015. Two corridors: total 32.38Km, Completion Cost Rs 15,709 Cr. After approving the DPR by State Govt., it has been submitted to Ministry of Urban Development, GoI for approval of Central Govt.on 29.03.2016. Detailed Design Consultant appointed and designs nearing finalisation for initial 9Km elevated stretch. Final DPR submitted on 29.02.2016. Two corridors: total 29.23Km, Completion Cost Rs15,964 Cr. After approving the DPR by State Govt., it has been submitted to Ministry of Urban Development, GoI for approval of Central Govt. on 09.06.2016. Final DPR submitted to State Govt. on 30.06.2016. DPR awaiting approval by the State Govt. Preparation of DPRs for Allahabad and Gorakhpur commenced.